Country Wedding DJ and dance instructor. 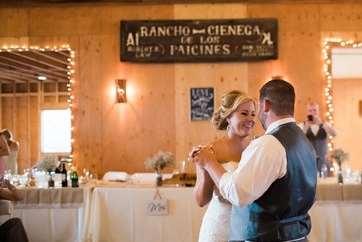 We bring FUN & Easy line dance lessons and country couples dance lessons to your party! Call 408-890-7940 to book. Want a great way to get your guests on the dance floor? Adam the Dancing Cowboy is a professional DJ who ALSO teaches fun & easy line dance lessons! Each month we have a group lesson at a dance studio. The class starts with a line dance and then after we learn a country couples dance. Check out this link below for registration info. The Rodeo Club in San Jose, CA has country concerts in a small venue setting on a frequent basis. Adam the Dancing Cowboy is the club DJ and Line Dance Instructor. Check out the Events page to see when you can come learn some moves! Join us for LIVE Country Music & dance lessons EVERY week at Charley's LG in Los Gatos! Check out the lineup on this page. Your guests will be guaranteed to get up and enjoy themselves on the dance floor when you bring Adam the Dancing Cowboy to teach lessons at your event. He has taught at many different types of events from decade birthday parties, backyard BBQ's, sorority & fraternity parties to corporate events. Past clients include Google, Kaiser Permanente and many others. We can come to your party in San Jose, San Francisco and just about anywhere. Get a Quote for Your Party! If you need a DJ for your Country Wedding, Adam the Dancing Cowboy can provide Country music, as well as most other Genres, from Top 40, Rock, Rap and many others. He specializes in Country, but knows how to read the crowd and mixes in favorites to keep your guests dancing all night! Even Julie from KRTY had something to say about lessons with Adam the Dancing Cowboy! As Seen at Rodeo Club and Heard on 95.3 KRTY!